Congregation Elohim Mekomo, a Messianic Jewish Congregation, invites and welcomes you to our worship service. Whatever your denomination or religious background, we are delighted to have you worship with us and we hope you will return to worship with us again soon. Perhaps you are traveling in the area, and will only be joining us for a brief visit. If that is the case, welcome, and may God grant you a safe trip to your destination. If you are looking for a Church, perhaps you will consider serving God with us. We are a family of believers, and if you are so lead by God’s Spirit, we hope you will become part of our family. Our eyes are on God. No one is watching you. You may sit, stand, kneel or assume whatever position or posture helps you focus on prayer. You may join us in singing, reciting prayers, dancing, playing tambourines, or just lifting your hands to God. Again, our eyes are on God not on you, so please do not feel uncomfortable about your style of worship. If you come and worship with us you are considered a member. We are all brothers and sisters in Christ so expect to be treated as a member of the family. A Messianic Congregation is a mixture of both Jewish and Gentile believers that acknowledge Jesus (Hebrew name Yeshua) to be the Messiah. We accept all 66 books of the Bible from Genesis to Revelation and we further believe that the Bible is the absolute, inerrant, and true Word of the Living God. We worship the complete Trinity: Father, Son, and Holy Spirit. We believe salvation is only through grace, by faith in Yeshua (Jesus). We celebrate Jewish festivals and the traditional Christian holidays. We display crosses, menorahs, and stars of David. 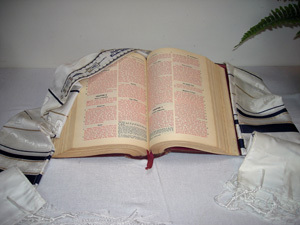 We use both the Bible and Torah scrolls in our worship services. You will see kippot and tallit (Jewish prayer attire) as well as suits, jeans, T-shirts and shorts. We pray in both English and Hebrew. We worship God in the full spectrum from quiet prayer to shouts of joy and dancing. There are 100’s of Messianic congregations and organizations in the United States. Of course one of the best known is Jews for Jesus which was founded in the early 1970’s. The two largest organizations are the Messianic Jewish Alliance of America (MJAA) and the Union of Messianic Jewish Congregations (UMJC). 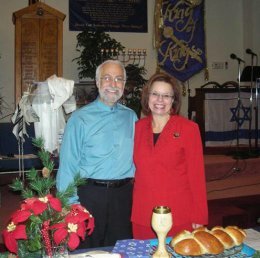 As with any other group or denomination, Messianic congregations vary from a heavy emphasis on Jewish tradition to a heavy emphasis on Christian tradition. We fall somewhere in between. It is a place where Jews can experience the fullness of the promised Messiah and Gentiles can discover their Jewish roots and heritage.